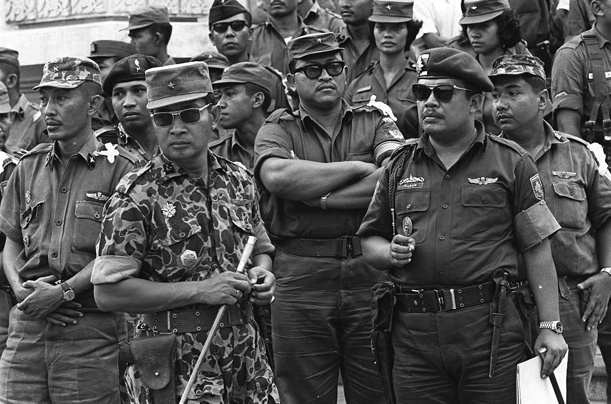 REBEL WITHOUT A CAUSE: General Suharto, left. Graeme Dobell’s analogy is rather useful. However, unlike the Indonesian military, the Fiji military did not play the role of great liberator of the people, bequeathing them freedom and independence from colonialism. This oversight changes the whole complexion of the Fiji political issue. More so, the Indo-Fijian population still have great loathing for the Fiji military, which is part historical and part reading of Bainimarama’s lip service, given that the 2006 coup has turned into another pro-Fijian political exercise in futility. The guardian role now claimed by the Fiji military is more against a purported ethno-nationalist threat. Given that the military is 99% indigenous, this threat will always emanate from within the military. The paradox of Bainimarama’s ‘New Order’ is that he will need to keep purging and rewarding his same ethno- nationalist constituency the rest of his rule - an untenable situation when one's base is always insecure. Size and location matters when it comes to holding on to power. Indonesia with its huge natural resource base was able to bankroll Suharto’s kleptocracy regime. Fiji does not have that luxury with a responsible China in an ANZUS surround. Bainimarama's coffers will eternally be low unless oil is found off the Tailevu coast. Today, Indonesia with President Yudahono spearheading a vibrant democratization process, has put paid to Suharto’s ‘New Order’ grand illusion by consigning it to the dust bin of history. If anything, according to Ed Aspinal the noted scholar on Indonesia, “ethnicity is losing political salience in Indonesia” and those democratic processes tend to fragment ethnic identities.” Hence, it makes sense for a quick return to democracy for all. Another major weakness of the Suharto, and indeed all military regimes, is that they all lacked ideological depth. In plain, its superficiality and failure to attract committed ideologues of any leaning signals its eventual demise. Indeed, in Fiji with an ever dwindling Indo-Fijian population, Bainimarama’s regimes quest for multiracialism and electoral reform is redundant. Bainimarama, and his analogous Dwi Fungsi (dual function) human security role, is tracking as a recipe for disaster for Fiji, just as it was in Indonesia. Yes, the ever dwindling Indo Fijian population is as a result of seed planted by Rabuka and GCC since 1987 to 1998. To stop that dwindling, GCC went further then the recommendations to include Indians in cabinet as the Indian electoral's representatives, to show that they want to hold Indians back at least from thereonwards. BUT with1 man 1 vote purported reform, with Indians no longer a threat is one that says that to save another mutiny or another false propaganda coup, there should be 1 man 1 vote to give undue advantage to the now majority to rule minority Indians permanently. So while security will return to the infighting Fijians, Indo Fijians will remain dis-allusioned by whatever comes out of anything less than the 1998 constitution and proper government as stated therein, and not one that was since 2001 onwards. So Fiji has more serious problems then what the vision is or has been for sometime now. With Fijians who are very smart politicians, Indians will be sidelined again under the name of democracy. So it will achieve opposite of the desire and good intentions and race will become more entrenched thereafter. This is when the anti Indians will thank Aiaz and also Chaudhry and FLP for the big f'up they would have done for the Indians from where there is no return. End result - Fiji will regress and not progress. Or will be filled with Chinese and Phillipino's to work the farms and replace the Indians. Take medication - your delusional.